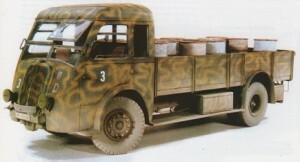 Kit Preview : 1/76 US Casts Renault AGK TTN 39 5t truck"
All I know is that US Casts is no longer in activity. Judging from the 3 kits I have the quality is comparable to Model Transport. There is not a lot of information on the web on the AGK. Here is a preview of the far superior Alby kit of the standard AGK. I removed several pounds of flash before taking the pictures. The main issues with the cab are the fact that the roof is too narrow and that the doors should be higher. The windscreen of the AGK comes down below the top of the doors as you can see in this picture of the 1/35 Scalelink model. The cab rear and doors must be raised, the roof split in two and widened, and the windshield framing rebuilt to size. Overall with some good scrach-building skills one should be able to turn out a good model of this very rare truck.